Review date: 24 July 2001. We Australians have been waiting for the fastest Hercules graphics card ever, the GeForce3-powered 3D Prophet III, for rather a while. And, as I write this, we're still waiting. It's now meant to show up before the 10th of August 2001, according to Guillemot Australia (Hercules is Guillemot's graphics product brand). In the interim, Aussie PC 3D performance freaks haven't just been pining away. They've been buying other GeForce3s, safe in the knowledge that all cards powered by this chipset are very much the same. GeForce3s aren't necessarily the best value - at close to a thousand Australian dollars, they're easily twice the price of their nearest competitors - but at the moment, there's nothing faster, full stop. The they're-all-the-same argument applies to other Nvidia-chipset boards, too. If a given GeForce 256 or GeForce2 or TNT2 card has the basic feature set, software bundle and price that you're looking for, then you don't need to worry about the brand. If the driver software the card comes with turns out to be elderly and/or unstable, you can just download and install Nvidia's reference drivers instead. There are a few GeForce3s available in Australia at the moment, like for instance Asus' AGP-V8200 Deluxe, which I review here, but cheaper boards from the less famous Taiwanese manufacturers haven't quite landed yet. When they do, they're likely to undercut the price of the Prophet III, whose Australian recommended-retail price is $AU999. As usual, the street price is likely to be a bit less than that. Aus PC Market will be selling this board for $AU990, including delivery within Australia. Ahead of its Australian release, Guillemot Australia were good enough to send me a Prophet III to play with. You might notice that there's a bit less anodised aluminium in this picture than you're used to seeing on GeForce3 cards. Or on GeForce2 Ultras, for that matter. Both of these card flavours have, as a matter of course, a phalanx of imposing looking heat sinks on their RAM chips, as well as a heat-sink-and-fan cooler for the main chip. The reason why this card doesn't have the RAM sinks is that it's a pre-release sample. It's not a retail board. 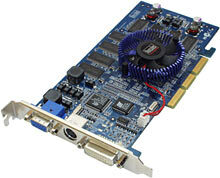 Retail 3D Prophet IIIs have the full heat sink complement. This card has the same slimmed-down Thermaltake Blue Orb on its main chip as the retail cards, but its memory chips are all stark naked. This, for comparison, is a Hercules PR picture of a retail Prophet III. The fact that heat-sink-less GeForce3 boards exist and do not catch fire when used, though, raises some obvious questions. If they're not needed to make the board work, then why are there heat sinks on the RAM? Well, the official answer is that the memory on GeForce2 Ultra and GeForce3 cards runs faster than any regular Standard Data Rate (SDR) or Double Data Rate (DDR) PC SDRAM, and can thus be expected to run hotter. No current PC main memory technology except for Rambus RDRAM needs any metalwork on top of the chips, as I explain in the review in which I play with Thermaltake's memory heat sink set, here. But once you're trying to run your DDR memory at the 460MHz that's the stock speed for GeForce3 RAM, then it's not entirely outrageous to suppose that some extra cooling might help system stability. Maybe it's not strictly necessary, and maybe the really big and spiky heat sinks might be somewhat fairly describable as chrome, but there's a real reason for them to be there. It's not just marketing. Just ask the marketing department - they'll tell you! I was interested to see how much truth there was to this claim. More on that in a moment. You don't get a lot of extras with the 3D Prophet III. But you do get three video outputs. As well as the normal 15 pin VGA output, there's a DVI connector for hooking up flat panel monitors that support this pure-digital video standard, and a combination S-Video/composite TV output too. 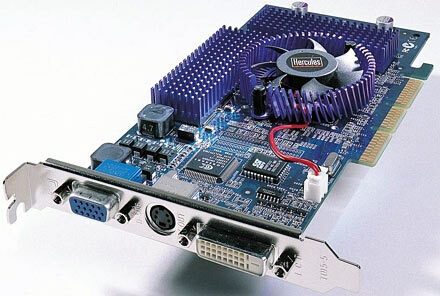 This isn't a multi-monitor card, though; you can't use both computer video outputs at once, and you can't display different things on the main monitor and on a TV. To enable composite output, there's the usual little mini-DIN to RCA cable included. 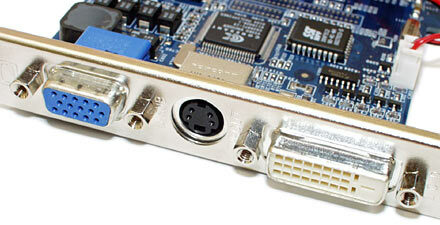 It allows you to connect the extra-pins video output to a plain composite cable. If you want to connect an S-Video display device, you just plug it straight into the mini-DIN socket. The Prophet III software bundle isn't an exciting one. There's exactly one CD, with a couple of maybe-worthwhile packages on it; Cyberlink PowerDVD for people with DVD-ROM drives, and the ubiquitously-bundled E-Color 3Deep colour correction software. On the plus side, you do get Nvidia's seriously show-off GeForce3 demos, along with various support software that you could download for free - DirectX, Adobe Acrobat Reader and so on. And you get an on-disc Acrobat format manual as well. There's not much point installing the actual drivers from the driver CD, since both Hercules and Nvidia have released more recent ones, which you can get here or here depending on whether you like Hercules' possibly-tuned drivers or Nvidia's reference ones. I installed the current reference drivers, version 12.41. So what effect did the lack of the RAM heat sinks have on this Prophet III's performance? Well, at stock speed, none. The thing worked just fine for hours on end of terrible, onerous stress testing. No twinkly pixels, no crashes, no worries. So I tried some overclocking. 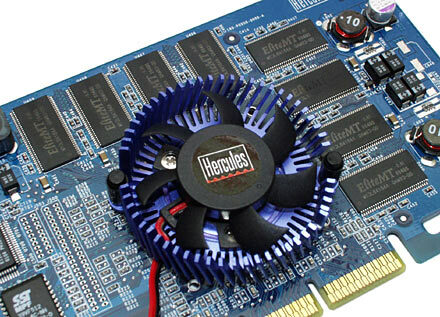 The stock clock speeds for GeForce3s are 200MHz core speed and 460MHz RAM speed. I managed to get 215MHz stably out of the Prophet III's core, but I didn't bust myself trying to find out how much faster I could take it. Because core speed doesn't matter. Some people have managed, allegedly, to get more than a 15% overclock out of the GeForce3 core, but I haven't managed much more than 10%. It doesn't matter much either way, because the core speed only has a big impact on frame rate when the RAM speed isn't the limiting factor. Which means low resolutions, 1024 by 768 and below. In these resolutions, there are exactly two things a GeForce3 can do, with any current software. It will deliver frame rates far higher than your screen refresh rate, or it will be held up by the limited performance of your CPU. Changing the core speed of the video card will have no impact on your computing experience, in either case. RAM overclockability has more effect. You have to be running a high resolution, preferably with Full Screen Anti-Aliasing (FSAA) turned on, but if you are, then cranking up the RAM speed can also crank up your frame rate. When I tested previous GeForce3s, I managed to get about 525MHz out of the RAM, stably. A bit more, if I didn't mind the occasional twinkly pixel. The heat-sink-less Prophet wasn't stable much above 500MHz. At 500MHz, it'd run all day; at 515MHz, it'd hang in seconds once I ran a 3D game. Wow! That's a 25MHz difference! That used to be a good speed for a CPU to run at, just by itself! It must make a significant performance difference, mustn't it? 525MHz is exactly five per cent more than 500MHz, and a 5% RAM overclock will not give you a 5% higher frame rate in anything. Maybe 3%, if you're lucky. When I overclocked the Pixelview GeForce3 (review here), I found that the biggest frame rate gain I could get from a 525MHz RAM overclock (14% faster than the stock 460MHz) was about 8%. And that only in high resolutions and/or when using FSAA. Other reviewers have noted no particular correlation between RAM or core temperature and overclockability, across different GeForce3 boards. It has been pretty clearly demonstrated that some GeForce3s are noticeably more overclockable than others, but there's little rhyme or reason to it. GeForce3s made by the same manufacturer have considerable top speed variance; it seems to be pretty much the luck of the draw whether you get a "good one" or not. Not that there's a lot of difference between the good ones and the bad ones, though. A highly overclockable GeForce3 can, if you're using Preposterous Resolution and FSAA, give you a quite respectable frame rate boost. Well above the 10% that, as a general rule of thumb, is what you need for a performance difference to be noticeable. But even a card that's a lousy overclocker, like my review non-retail Prophet III, will be able to manage about half as good a boost as the very speediest GeForce3s. In other words, the difference between the best overclockers and stock speed is significant, but the difference between the best overclockers and the worst overclockers is a lot less exciting. Frankly, I'm inclined to think that the absence of heat sinks on my review card's RAM had nothing much to do with the Prophet III's lower RAM overclockability. The thing was sitting in my quite well cooled case, on a cool day, so with or without RAM-sinks it wasn't running very warm. GeForce3s sitting in poorly ventilated cases on hot days have RAM chips that are warmer than the ones on the Prophet III when I tested it, and yet they don't crash. So maybe it was something else. This is a pre-release board, remember. Its overclockability might be limited by early-production teething troubles. It's not likely to be the RAM chips' fault. The Prophet III's EliteMT 3.8 nanosecond DDR memory chips are exactly the same chips you'll find on every retail GeForce3 to date. I can't say I'm totally convinced that RAM-sinks on GeForce3s, or any other current video card, are nothing but tinsel. But I do think there's precious little evidence to suggest that they do very much. And anybody who buys upgraded after-market all-copper super-zooty video card RAM-sinks for anything but purely cosmetic purposes needs, if you ask me, his or her head read. Personally, I can take or leave GeForce3s right now. If they cost the same as a GeForce2 Ultra then they'd be a rather good buy, but they don't. And, for most people, they don't yet deliver performance to justify their price. That's not the GeForce3's fault. It's just that there aren't any games yet that take advantage of the new features in the GeForce3. The GeForce3 certainly is a howling fast pixel-flinger that does what the GeForce2 does only considerably faster. But it's also a highly programmable rendering system, an it will be able to do some pretty darn amazing things as soon as games to support it hit the market. Unfortunately, as of now, pretty much no such games have. I've swapped my faithful Leadtek GeForce2 GTS (reviewed here) out of this machine to make way for a few different GeForce3s, now, and I'm getting less and less impressed by the difference. Yes, benchmark scores take a big leap, especially in Monster Resolution. But I've only got a 19 inch monitor, and so I can't clearly display resolutions above about 1280 by 960. My GeForce2, on every game I've tried, can do more-than-fast-enough 3D in 1280 by 960, with FSAA turned off. With a GeForce3, I can turn FSAA on, and still have no frame rate complaints at all. FSAA at 1280 by 960 with no perceptible frame rate penalty is a nice thing to have, but it doesn't make a big difference to my gaming enjoyment. The thing about running in the highest resolution your monitor can clearly display is that the steps of the "jaggy" diagonal edges which FSAA smooths become really small. You can still see them, quite clearly, when you're looking at something like a dark mountain silhouetted against a pale sky. But it's not as if they leap out and shake their naughty bits at you. Well, they don't do it to me, anyway. Some people clearly find jaggies a lot more offensive than I do, because Lord knows GeForce3 boards are walking out the retailers' doors, even for the very thick end of a thousand Australian dollars. But GeForce2s with knobs on are half the price, and there are plenty of cheaper options. Hercules' own Kyro 2 powered Prophet 4500 (reviewed here) is only $AU401.50 delivered, and it's right up there with the better GeForce2s for pretty much everything that matters. And better, for FSAA. The GeForce3 is a great thing, and you'd better believe I'd accept one for free. But since nothing much makes use of DirectX 8 programmed-renderer features yet, the strengths of the GeForce3 are largely left idle. In a year, there'll be some stunning games for cards like this, and the cards will be a lot cheaper. In the meantime, unless you want a cheaper alternative to a super-expensive pro 3D card for serious visualisation purposes, a GeForce3 still isn't an easy purchase to justify.